I don’t often make sushi at home because it’s always been hard to find organic ingredients and sustainable seafood. Until now! I was thrilled to discover that SPUD.ca has sustainable seafood options, including my husband’s favourite, salmon roe. I whipped up this easy avocado and salmon roe sushi for a quick dinner using ingredients from my SPUD box! 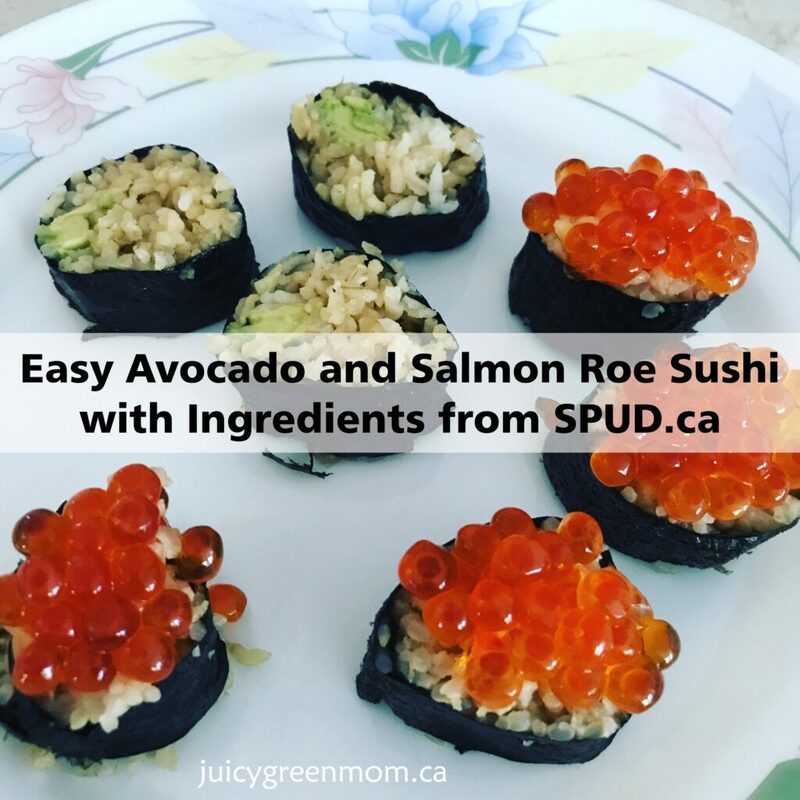 Make these easy avocado and salmon roe sushi rolls with sustainable and organic ingredients so that your family can enjoy without worry! Mix the cooked rice with the rice vinegar and avocado oil. Lay out 1 seaweed sheet and spoon rice evenly along the bottom third of the sheet. Press the rice down firmly with your fingers and a spoon. Roll the sheet with the rice while squeezing the rice to make sure it's rolled tightly (if you have a sushi mat, it'll make it a lot easier). Slice with a sharp knife and spoon the salmon roe on top. For the avocado rolls, slice the avocados into long lengths. Press the rice down firmly onto a seaweed sheet, and add avocado slices on top of the rice. Spoon a little bit of mayonnaise across the avocado. Roll up the avocado roll and slice. I am so thrilled that I could get all of these ingredients easily and make the sushi at home. Don’t get me wrong, I love going out to Japanese restaurants, but it’s nice to be able to make sushi at home and know exactly what’s going into it! Will you try making this easy avocado and salmon roe sushi?